Step 1 Preheat oven to 450°, and coat a baking sheet with cooking spray. Step 2 Sprinkle flour on a flat surface, and roll dough to desired size. Step 3 Bake until dough is lightly crisped underneath, about 8-10 minutes. Step 4 Grill chicken over medium-high heat in a nonstick skillet, stirring frequently—about 12 minutes. Step 5 Steam broccoli in a closed skillet, about 3 minutes, add arugula and steam for another minute until wilted. Season with salt and pepper. 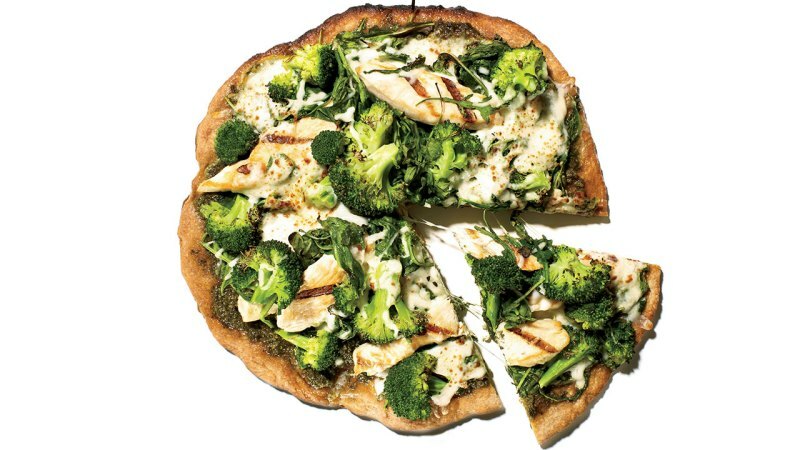 Step 6 Spread pesto over crust, arrange chicken, broccoli, and arugula, and top with cheese. Return pizza to oven until cheese melts—about 8 minutes. Look, it’s a fact of life: Everyone, at some point or another, has a huge craving for pizza. Instead of buying an overpriced, high-calorie delivery pie, try this slimmed-down version that combines the protein benefits of chicken with broccoli, which helps to clear estrogen and toxins from the body.